Exciting, fun, relaxing and informative vacations in some of the most breathtakingly beautiful destinations in the world -- the Land of the Maya. Discover the beautiful beaches of the Riviera Maya, the tropical jungles of the Yucatan, the lush rainforests of Palenque and Tikal, the pristine jungles of Belize, the impressive ruins at Copan and the fascinating culture of the highland Maya in Chiapas and Guatemala. Custom Vacation Packages Let us work with you to design a custom vacation package that meets your individual interests and budget. Choose from a wide variety of exciting activities in the beautiful Land of the Maya. From economical to luxury we can help you design an unforgettable vacation. 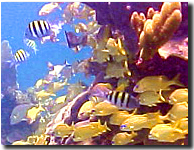 See our Special Off Season family vacation packages for discounted May to mid-December trips in the Riviera Maya. Accommodations There are a wide variety of accommodation options in the various regions of Land of the Maya. Hotels in all price ranges, all-inclusive resorts and condos and villas. We never charge any fee for researching your best hotel options and we take the time to find you the best price. Save hours of research and contact our hotel experts. We know the "good, bad and ugly" of hotels in each region and will help you book a hotel that fits your budget and individual needs. Transportation There are a wide variety of transportation options in the various regions of Land of the Maya. It is important to consider that although the distances between points may not look very far on a map there are few major highways and most roads are narrow and slow going. We move people through all regions of the Maya World each day so let our experts tell you what is logistically possible. Day Tours and Shore Excursions Reserving a day excursion for your Cancun or Maya Riviera vacation is a great way to enhance your overall experience of this diverse and exciting part of the Maya world. Whether you want to schedule a break from your all-inclusive hotel or have a day in port on your cruise ship and want a fun shore excursion - let MayaSites Travel Services work with you to design that special day trip. Year-round Escorted Tours Our private tours for one or more people allow you to create a fun, exciting and educational vacation experience, all designed with your custom itinerary and a MayaSites guide accompanying you and taking care of the details. And when you book a tour with us you can count on our 7 days a week customer support. 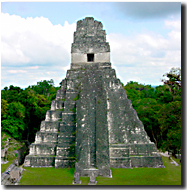 Special Small Group Tours MayaSites Travel Services offers fixed date tours each year with activities on special dates such as March 19-22 Spring Equinox at Chichen Itza and Dzibilchaltun and Carnival Festivals of the Highland Maya February 11-19, 2015. Our small group tours take the guesswork out of travel to the Land of the Maya -- without taking away your independence. Educational ToursThe diverse ecology, history and culture of Mayaland presents an ultimate experience for students. MayaSites offers substantial discounts to student groups in order to encourage student travel. 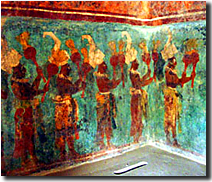 Educational Descriptions of Maya Ruin Sites Visit our site description pages for photographs and information about Maya archaeological sites. 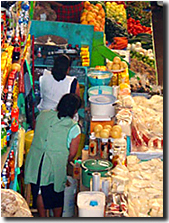 Buyer's Tours Our shopping experts can assist you in buying products in the Land of the Maya such as silver, amber, jade, textiles, art and more. Whether buying wholesale for your retail business or outfitting your home with folk decor our expert buyers make sure you get the best price! For more information about MayaSites Travel Services visit About Us. Or, see our client feedback on our Testimonials page. 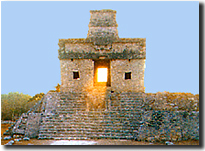 Maya Sites Travel Services has one goal in mind --- to give you a hassle-free vacation. Let us help you plan an unforgettable journey to the Land of the Maya. All photographs Copyright 2000-2014 by MayaSites Travel Services. All rights reserved.